This project will show how to transform a (Raspberry Pi + Pi Camera ) powered RC car into one capable of object detection and autonomous driving. To do this we will deploy two deep neural networks. One for object detection and the other for autonomous driving using inference for steering and throttle. An RPi 3 serves as the vehicle computer. Due to limited resources on the RPi only one of the networks can run at a time. The idea is to train the neural network to identify garbage bins so that the car can pick em up autonomously. The project consists of two parts. In the first part the plan is to to use a moderate size convolutional network to recognize objects in the input video feed from the Pi Camera. TensorFlow will be used to deploy the CNN model and OpenCV will be used for managing the video feed from the Pi Camera. In the second part we are going to use behavioral cloning to get the car to navigate autonomously. The modified car will also be augmented with additional sensors such as ultrasonic distance sensor, GPS and 6-DOF IMU as well as implement additional telemetry features. Back in 2017 (a year ago), Google released MobileNet, and earlier this year MobileNetV2. These networks are custom optimized for working on embedded devices like smartphones. Coincidentally the MPU used on RPi 3 falls in this category since it can run either Linux or Android. The first problem one encounters is the limited RAM and computational capacity of Raspberry Pi 3. Even though this is a quad core MPU it is still not enough when dealing with massive weight files needed by YOLO (You Only Look Once) type networks. The first solution that comes to mind is to send the image acquired via the Pi Camera via WIFI to an external PC and do the object inference stage there and then send commands to the Donkey Car. In essence we have to contact the mother-ship on every step.This is inefficient not to mention impractical in scenarios when communication with an external laptop is not possible. I initially tested a VGG16 network which was relatively accurate when detecting garbage bins. However it could not run on the RPi since the weights alone were around 350MB!To test the VGG network refer to the attached code at the end with similar images as input. So to solve the problem of huge weights sizes we are going to run all models on the RPi using slimmer networks. Specifically we are going to use the a MobileNetV2 Single Shot Detector based CNN. This is a DNN which has been optimized to have very small (relatively) weights. The technique is called transfer learning since we are using a pre-trained network weights. Before we delve into the software we have to make some hardware modifications. A Magnet car was used for the Donkey Car project. Magnet is an RC (remote controlled) car that operates using a 2.4GHz multi-channel radio. To transform the Magnet into a Donkey car there are a couple of steps that have to be undertaken. First remove the top-cover by removing the clips and two screws on the back. You will find a cage with two drivers. Remove this too and then remove the outer top cage.Now you have access to the circuits on the car. From the top once can see the receiver, the ESC (Electronic Speed Controller) and the servo. The receiver is a 4 channel receiver with a B/C (battery elimination) circuit. Each channel uses a 3 wire connector. Channels CH3 and CH4 are not used. The ESC takes the battery as input, power switch and the input from the receiver channel 1. The servo is connected to channel 0 of the receiver. The servo is used for steering. The steering angle can be trimmed manually if driving via a joystick or it has to be calibrated. Two 3D printed plastic adapter are used, after removing the two screws and the body top. You have to screw the two adapters in place of the existing clips by using the same screws.After replacing the two clips with the two 3D printed adapters now we can mount the top wooden Donkey car plate. Next screw down the camera handle on the base board plate. Then place the plastic threaded parts on each hole. These are used for securing the Raspberry Pi and the servo controller in place. Mount the RPi and the servo controller on the wooden plate. I ended up using zip-ties for securing the RPi since I did not want to put a metallic screw near the antenna. After screwing down the servo controller connect the I2C bus pins from the RPi to the servo controller. Next, take a small knife and cut the zip-ties that holds together the ESC and servo 3 pin wires. When connecting to the external servo controller both of the connections to the receiver has to be disconnected from it and connected to channels 0 and 1 of the servo controller which we will later mount on on the DonkeyCar top-plate. Mount the wooden plate on the adapters.Now use the clips to attach the DonkeyCar plate to the Magnet Chassis adapters. Mount the Donkey car plate on top and use a short USB cable to connect the USB battery to the RPi. The throttle and steering cables will protrude from the opening in the plate and connect to channel 0 and 1 of the servo controller mounted on the Donkey car plate. The main issue with the standard configuration is that there is no sensor used to measure speed or distance to obstacles. I added an 6DOF MPU6050 IMU which allows the RPi to measure 3D acceleration and turns, Next I added a GPS to the serial port and also an HCSR04 sensor for distance measurement. The HCSR04 however works via 5V and needs a level shifter. All the additional sensors will be time-stamped upon acquisition and used to augment the training vectors for the deep neural network. To support the extra sensor one has to modify the manage.py script to add this functionality. To use the IMU, I initially tried a Python Library for FXOS8700 on Debian Stretch. This did not work out of the box due to the repeated start bug of the RPi, so I ended up using an MPU6050 which also comes with a gyroscope. The meta.json file under the tub folder has to be augmented to support logging IMU data. Finally I also added a GPS module to the unit. While this cannot be used indoor, it is useful to add for outdoor tests in areas where you can connect to a WIFI network. If one needs to log in GPS data the same modification as with the IMU have to be implemented. 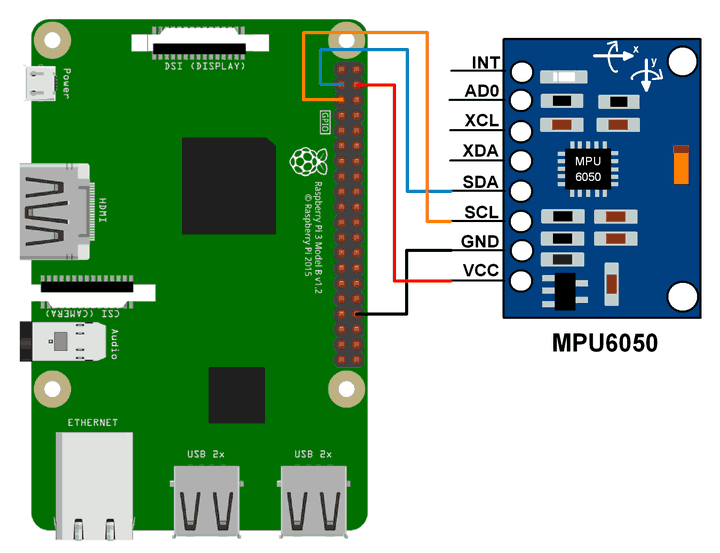 To use the HSCR04 distance sensor once has to install the RPI.GPIO library from the python environment. The idea here is to implement an AI pipeline for object detection running on the RPi. The first step will be to deploy an object detection DNN that will work on the RPi 3 without dependence on external devices. Let's get started by installing the software needed. The project uses TensorFlow and OpenCV. In simple terms in order to do inference on the Raspberry Pi we use an already trained network. After the weights are loaded object detection and inference is done for each camera frame. One thing that needs to be pointed out is that TensorFlow uses a different file format unlike Keras which has a relatively simple workflow for loading weights as h5 files. Clone the official TensorFlow model repository. Next step is to install the Protobuffer compiler for the weights of the MobileNetV2 SSD. Keras uses a different file format from TensorFlow. So we have to deal with Protobuffers which is the native format for TensorFlow. Now we are read to rumble. This will allow us to convert the weight into a format that TensorFlow understands. The MobileNetV2 model we are going to use are fetched from this page. The model we are using is the one with the smallest image dimensions 160x128. The Protobuffer compiler installed above will be used to convert the weights into compiled files so that TensorFlow can use them. Here we are going to use the SSD (Single Shot Detection) with a MobileNetV2 in order to be able to run the program standalone on the RPi. The object detection program can be tested and run independently from the autonomous driving program. Since the network is trained on a limited number of categories it only recognizes objects from those correctly. I tested on people, cars and potted plants and bins as well as bottles. As you can see it's not very fast, clocking at 0.8 - 1.3 frames per seconds on average. It however runs on the Raspberry Pi 3 so not much is expected. And that concludes the object recognition stage on the RPi. The idea here is to use behavioral cloning to predict the steering angle. This will allow the car to autonomously navigate around a track. To do that we will have to first install the DonkeyCar from Github, acquire some images during the training phase and then train the model on a laptop. At the end we can transfer the model weights to the RPi via SCP and test it on the track. This task is independent from the object detection model we used above so these two models have to run separately. We are going to use virtual environments so first load the profile and then start it. From the same virtualenv issue. pip install donkeycar[pi]$ python -c "import donkeycar as dk; print(dk.__version__)"
Before training we have to calibrate the car so that the wheels are straight in default mode and the throttle works correctly. I found the steering angle between 300 and 400 works fine. The throttle and steering data will be cross-referenced with the timestamped camera frames. These files are then fed to a CNN which attempts to infer throttle and steering parameters based on new images. The current software also logs in acceleration from the MPU6050 accelerometer and Gyroscope. These are currently used for telemetry. Based on the acquired data now we will create a model that the Deep Neural Network will provide to us from the supplied data. The first problem one encounters is that there is no WIFI on an open track. I used an indoor track for training. Install donkeycar with GPU support on a laptop equipped with a Nvidia graphic card. This has to be included on the DonkeyCar Package before you install. After that issuing the above command works as you can see on the image below the training loss decreases constantly. The training is done on a laptop equipped with a Cuda GTX860 with compute capability of 5.0. Initially I started implementing a basic training network on my own. This will use all the acquired images and throttle and steering data to train the network. In the end a Keras h5 weight file is obtained which shoudl be transferred to the RPI by using WinSCP or rsync. The thing to keep in mind here is that the deeper the network the larger the weights so you have to strike a balance. In the end it looks like the ddefault network provides a good compromise so i ended up using that. Since throttle and steering are continuous floating point values the algorithm splits all these two into different bins. Each bin is then matched with images and passed to the network as key value pairs. The networks then learns to control the throttle based on the features in the images. in this case the rope. The normal frame rate for object detection is on average around 0.8 frames per second since this runs natively on the RPi, although sometimes I can get 1.3-1.4 fps. 1 / 2 • Here it is detecting multiple cars. Obviously you are not going to get state of the art detection with a network like mobilenet V2. However in comparison to much bigger networks such as VGG16 or Resnet performance is exemplary. While running this script takes around 78-80% of the PI resources with no video recording. This project showcased how to build an autonomous AI capable of object detection and autonomous driving based on behavioral cloning. An SSD MobileNetV2 DNN were leveraged for object detection and the DonkeyCar stack was used for autonomous driving. Fixes an issue with KerasCategorical class. Augmented with IMU recording capability..
Issue python manage.py drive to record data. Uses calibrated values for steering and throtling. ROPE_TOKEN="GET A TOKEN AT ROPE.DONKEYCAR.COM"
Code for object detection using Tensorflow and OpenCV. # It draws boxes and scores around the objects of interest in each frame from the Picamera. Replace this file with Keras.py on the donkey /parts folder and issue pip install e .
# stop training if the validation error stops improving. Categorial Steering output before linear conversion. Thanks to Keras team and Evan Juras.